Are you preparing for your wedding but you won’t walk down the aisle until you LOOK perfect??? There’s a solution. HOUSE OF BRIDES, a new competition reality show for E! Entertainment Television, is casting engaged women who want to go through a total image transformation before the big day. The winner will not only look great, but also win her dream wedding with the help of Hollywood’s top wedding professionals. Giving her and her wedding the full celebrity treatment. If you are a bride-to-be who is willing to compete with other ambitious engaged women for the wedding of your dreams then HOUSE OF BRIDES is the show for you. Casting Directors will be in the following cities, but are accepting applications nationwide! To be considered, please go to www.houseofbridescasting.com . There brides can fill out the application process for potential cast members. The show is open to any bride in any state. Participants must be over the age of 18. 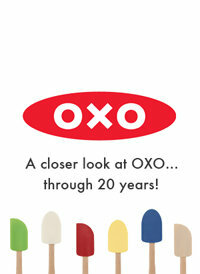 Every Tuesday, a new photo will be posted on www.acloserlookatoxo.com, which will be a zoomed in picture of the featured Product of the Year. Try to guess which product it is, and visit the site the following Monday to see if you were right! Upon the reveal, you can learn a little more about the thought that went into developing each product. Each week, 20 lucky (and correct) guessers will win a Product of the Year, from 1990 through 2010! Also, be sure to check out their facebook and twitter page. Claudia Endler Designs has been designing modern contemporary bridal collections for men and women for more than 10 years. 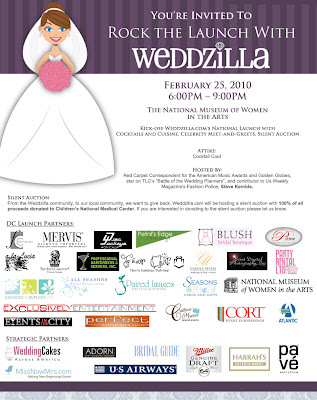 Featured in numerous bridal publications such as Brides, Modern Bride, L.A. Brides, Inside Weddings and Ceremony Magazines, Claudia Endler Designs' blend of high fashion and architectural elements makes it a chic choice for the bride and groom alike. Make sure to check out this site and also check out her Facebook and Twitter Page. Sweet N Salty by Design is an amazing company that hand decorates and tops each pretzel with yummy toppings for special occasion and holidays. These breath taking designs are almost to pretty to eat. 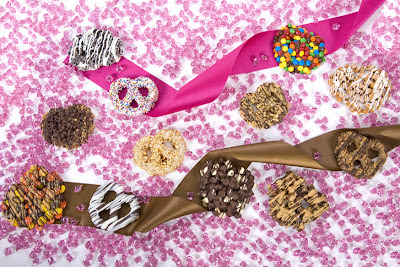 Every pretzel that is decorated is made sure that every bite is a party of sweet flavors dancing in your mouth. I would really love for The Relentless Bride to try these scrumptious treats. Lucky for Relentless Bride readers, Sweet N Salty By Design is offering 10% off (Discount code: SWEET2010) for any custom wedding favor order! Be sure to check out this site... i'm drooling already! Stay tuned for an awesome giveaway from them soon! Tell me what to do! You know I will help! WHOA! 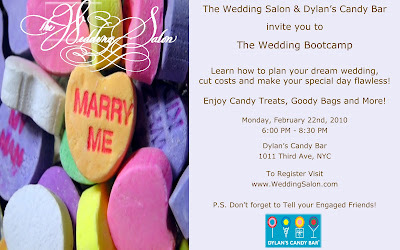 I can't believe I missed Wedding Salon and Dylan's. Boo!